Aim and Ignite - fun. 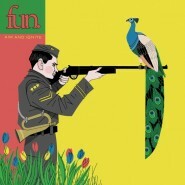 After The For­mat went on indef­i­nite hia­tus, Nate Ruess formed fun. along with Jack Antonoff of Steel Train and Andrew Dost of Anathal­lo, with their first album released on the 25th. The self-released Aim and Ignite is a strange album, with unex­pect­ed tran­si­tions, active lyrics, inter­est­ing (if some­times con­fus­ing) instru­men­ta­tion, and curi­ous themes. All of this per­plex­i­ty ends up work­ing quite amaz­ing­ly for fun., result­ing in a well devel­oped and tru­ly engag­ing album. From the not-quite-clas­si­cal intro­duc­tion to “Be Calm” to the gui­tar solo at the end of “Take Your Time (Com­ing Home),” Aim and Ignite is filled with extreme­ly inter­est­ing and entire­ly unique instru­men­tals. From the first track on, some of the most notice­able parts of the album are not the sec­tions of the tracks them­selves, but the tran­si­tions between the (often con­trast­ing) sec­tions. And while the first tran­si­tion doesn’t quite man­age to clean­ly con­nect the intro­duc­tion of “Be Calm” to the first main sec­tion, the rest are expert­ly done. Whether it’s Nate Ruess’s voice, a drum roll, or a sequen­tial lead, every part con­nects amaz­ing­ly to the next (an espe­cial­ly impres­sive feat giv­en the num­ber of com­plete­ly dif­fer­ent parts on “Be Calm” or “Ben­son Hedges”). And while there is a sec­tion of Aim and Ignite run­ning from “I Wan­na Be the One,” to “Light a Roman Can­dle with Me” two tracks lat­er that doesn’t man­age to retain the odd excite­ment that accom­pa­nies most of the album, there is noth­ing to regret in Aim and Ignite. Nate Ruess’s voice, pol­ished by his time with The For­mat, rings through Aim and Ignite with an impres­sive com­bi­na­tion of strength and emo­tion while man­ag­ing at the same time to vary his style enough that he almost nev­er stag­nates. Begin­ning with his strong entrance on “Be Calm,” Ruess’s care­ful­ly craft­ed deliv­ery is clear, dis­tin­guished by espe­cial­ly long phras­es and an uncan­ny abil­i­ty to mod­u­late tem­po such that it fits with the music per­fect­ly, even with the large shifts dur­ing the tran­si­tions between sec­tions on sev­er­al tracks. A cap­pel­la vocal sec­tions make up some of the tru­ly excel­lent parts of Aim and Ignite, includ­ing on “Ben­son Hedges,” which includes a gospel-inspired intro, com­pared with the bar­ber­shop-like sec­tions of the lat­er track “All the Pret­ty Girls,” both of which do won­ders for the ener­gy lev­els of their respec­tive tracks as well as cre­at­ing incred­i­bly inter­est­ing and enjoy­able music. Aim and Ignite is filled with lyrics that eas­i­ly com­ple­ment the ener­gy exud­ed by the music and by Ruess him­self and which simul­ta­ne­ous­ly dis­play the cre­ativ­i­ty (and strange­ness) of fun. Thanks to Ruess’s ten­den­cy towards long phras­es, some of the best lyri­cal gems of the album span an entire para­graph: “So I drove until we both broke down; / I was stand­ing in a black town / Believ­ing the wrong type of TV would bring me to safe­ty / But between MTV and Mr. O’Reilly / I’ve come to the fact that I can’t be defined / So I turn it off.” Simul­ta­ne­ous­ly image-packed, amus­ing, and odd­ly mean­ing­ful, this depicts the lyri­cal style of Aim and Ignite per­fect­ly. Not only is Aim and Ignite an amaz­ing album, it is an amaz­ing­ly diverse album. “Be Calm” alone moves from accor­dions and vio­lins to rock, while “Ben­son Hedges” tran­si­tions direct­ly from gospel a capel­la to elec­tron­ics. And though “Walk­ing the Dog” and “Barlights” are two of the best tracks on the sec­ond half of the album, they sound noth­ing alike. On Aim and Ignite fun. has pro­vid­ed some­thing for almost every lis­ten­er, while still main­tain­ing an extreme­ly high lev­el of qual­i­ty through the quite dras­tic vari­a­tion. From its care­ful­ly orches­trat­ed begin­ning, Aim and Ignite blos­soms into an ener­getic and hon­est­ly delight­ful album. With a more exper­i­men­tal base than front­man Nate Ruess’s last project, The For­mat, fun.‘s debut album is occa­sion­al­ly con­fus­ing, some­times bizarre, and always inter­est­ing. Very few moments of Aim and Ignite are bor­ing - and how could it be, with the amount of unbri­dled cre­ativ­i­ty that has obvi­ous­ly been poured into it? And though Aim and Ignite is expert­ly com­posed from a huge num­ber of var­ied parts, it isn’t just a great album musi­cal­ly. At its core, Aim and Ignite is sim­ply fun. This post is tagged 90-100, fun.